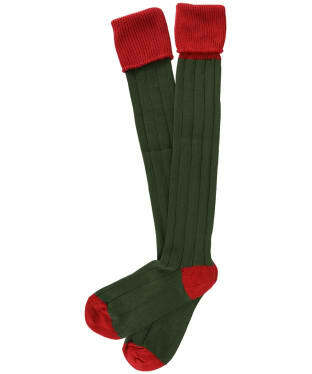 The Men's Pennine Regent Shooting Socks are the perfect companion to take with you out into the country this season. 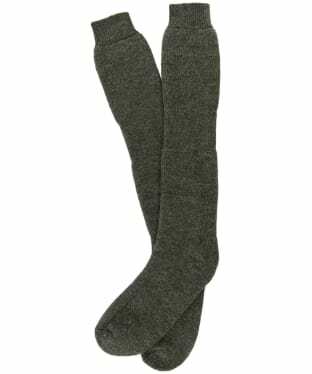 Crafted from merino wool and nylon for a high quality, soft and ultra comfortable sock that will last for years to come. The heel and toe both have contrasting colours while top has a cross pattern, perfect for those country walks this season. Crafted from a soft and durable blend of warm merino wool, durable acrylic and a little Lycra, the Men's Schoffel Ptarmigan Pro Socks will pair fantastically with your country boots and brogues to complete your field day attire! Complete with Nylon reinforced heels and toes for added durability, these Schoffel socks also boast calf, ankle and footbed support to keep your socks in place, as well as graduated compression for increased performance. 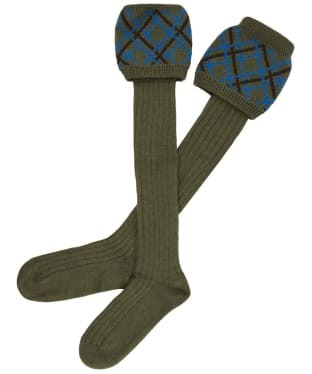 Crafted from a soft and stretchy blend of warm merino wool, durable acrylic and a little Lycra, these Men's Schoffel Lattice Socks are the perfect complement to your boots this season! 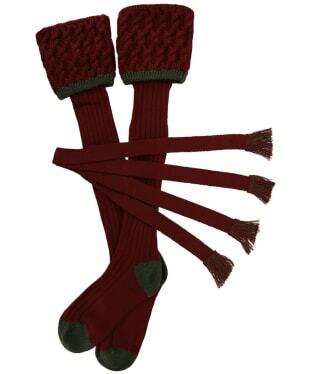 With just the right amount of stretch for flexibility and comfort these two-tone socks feature nylon reinforced toes and heels, and boast a textured knit to the cuff for a unique finish. 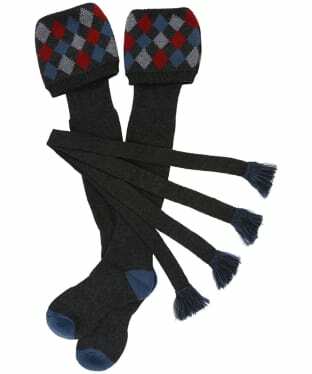 The Schoffel Lattice Socks come complete with matching garters to truly finish the look off in classic country style. 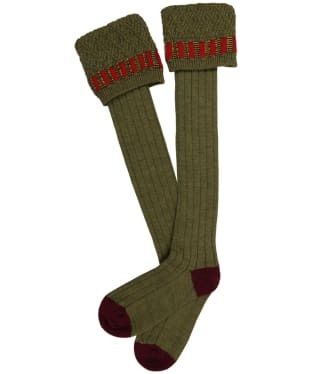 Perfect for adding warmth and style to your country ensemble, the Men's Pennine Stalker Shooting Socks have been constructed from the highest quality wool and nylon, expertly crafted to keep you comfortable, enhancing performance on those country pursuits. Built to last, the shooting socks boast a nylon reinforced toe and heel for the upmost durability as well as a flat toe seam to aid comfort. 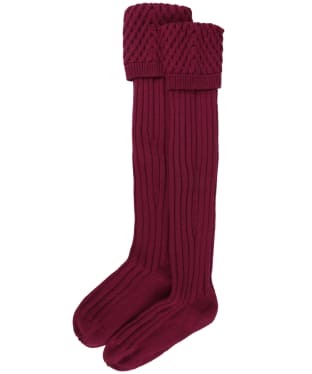 The Men's Pennine Kendal Luxe Shooting Socks have been crafted from the highest quality extra fine merino wool, offering a luxurious feel, as well as added comfort and warmth. The toes and heels have been reinforced with nylon, creating a shooting sock that will be durable and supportive for feet, perfect for all day wear. 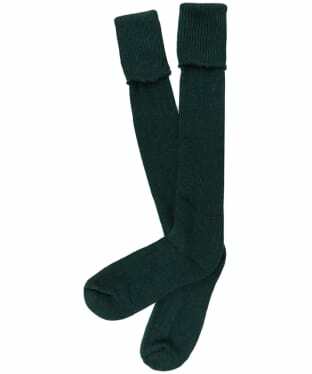 The leg of the sock has been tailored for a wider fitting calf, offering added ease of movement and wearability. 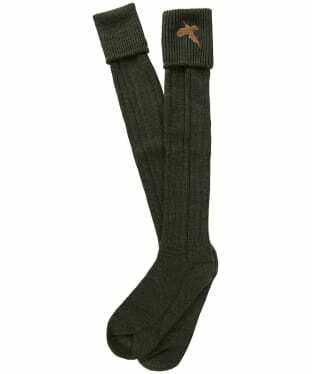 The Men's Pennine Poacher Knee High Shooting Socks are sure to keep you feet comfortable and warm on those days spent in the country. 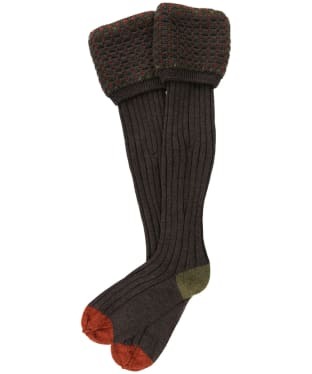 Crafted from the finest wool, the Poacher socks feature nylon reinforcement to the toes and heels, offering a durable finish that is sure to support your feet and enhance performance. The Men's Schöffel Ptarmigan II Socks are the perfect accompaniment for your country attire this season and beyond, offering you soft yet durable socks you are sure to love complete with matching garters! 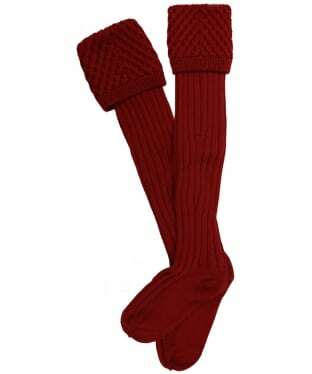 Newly updated for the season these socks feature a new cushion foot to offer you added comfort and wearability. 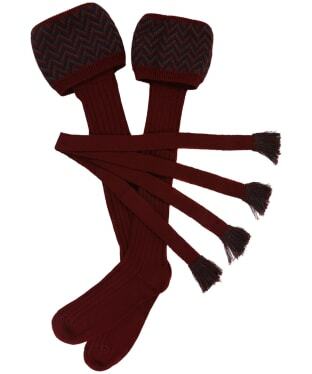 The nylon reinforced heel and toe offers you a sock which is built to last! 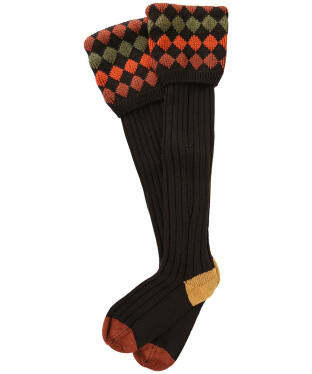 Complete your country look this season and beyond with the Men's Alan Paine Patterned Socks, boasting a pattern detailing to the top you are sure to love! 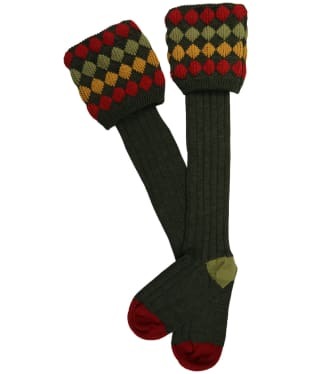 These socks have been crafted from a blend of wool, nylon and lycra, finished with a reinforced toe for a comfort yet durable sock. 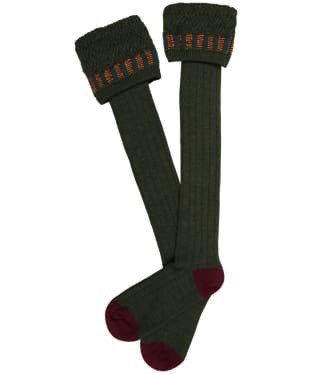 The Men's Schoffel Teigh Socks are the perfect addition to your country sporting wardrobe. 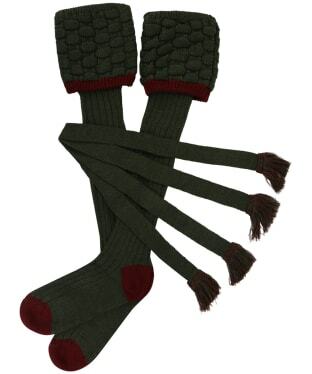 These ribbed and textured socks provide a comfortable and snug fit around the leg and have been crafted from a soft and durable mix of acrylic, lycra, and merino wool. The heels and toes have been reinforced with a robust nylon, and the Teigh socks are also machine washable for added convenience. 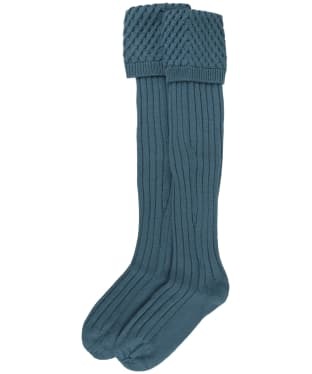 The ideal accompaniment to your sporting attire, the Schoffel Herringbone Sock have been expertly crafted from durable acrylic, flexible lycra and super soft merino wool for a comfortable wear when you're out in the field. The heels and toes have been reinforced with a robust nylon to ensure they will withstand all day wear inside hardy boots and shoes. Matching garters add a flash of interest to your outfit, while the practical design means they are machine washable for ultimate convenience. 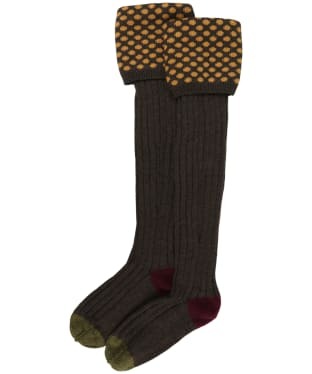 The Pennine Chelsea socks are a stylish way to complete you country outfit. 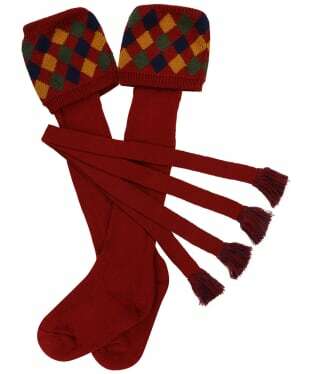 With a crosshatch stitch design around the cuff to give the socks texture and a detailed design. 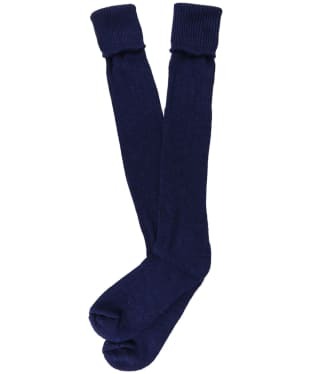 The Chelsea socks are crafted with the highest level of detail, using high quality wool in a twofold yarn, and knitted to just the right tension, to give you a ultra comfortable and practical pair of shooting socks to complete your outfit. The Men's Pennine Pembroke Shooting Socks have been crafted from the finest cotton, for a highly breathable, soft feel that are sure to keep feet comfortable on those country pursuits. Perfect for pairing with your favourite brogues or loafers, the shootings socks boast nylon reinforcement to the heel and toe for that durably, quality feel. Finished with colour contrast detailing, the Pembroke socks are sure to complete your outdoor ensemble with stylish ease. 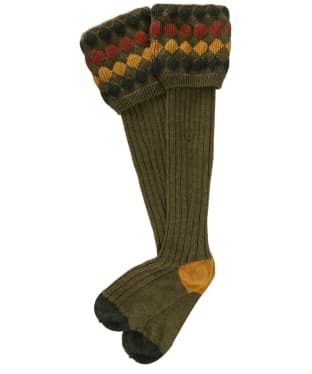 Perfect for completing your outdoor ensemble, the Men's Pennine Cumbrian Shooting Socks have been crafted from extra fine merino wool for that added touch of luxury, with a nylon reinforced heel and toe, to ensure that these shooting socks will last your for years to come. 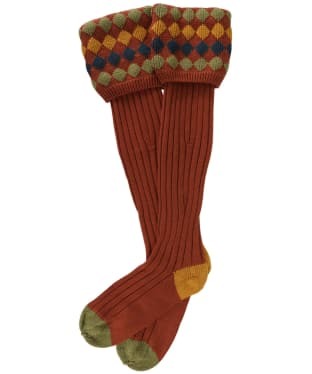 Sure to offer the upmost comfort whilst you are walking, the Cumbrian Shooting socks are finished with a contrasting colour design to the upper, heel and toe, for that added touch of stylish detailing. 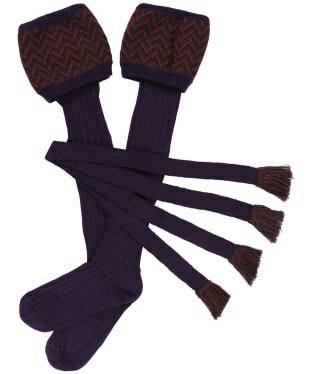 Sure to offer warmth on those cooler days, the Men's Pennine Devonshire Shooting Socks have been crafted from a quality wool construction, with added nylon to the heels and toes, for a reinforced, durable feel. 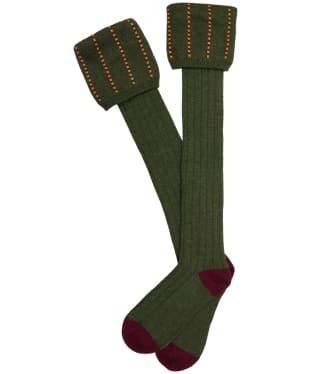 Perfect for those days spent out on a country pursuit, the Devonshire Shooting Socks feature a colour contrast striped design to the cuffs of the socks, for that added touch of stylish detailing. 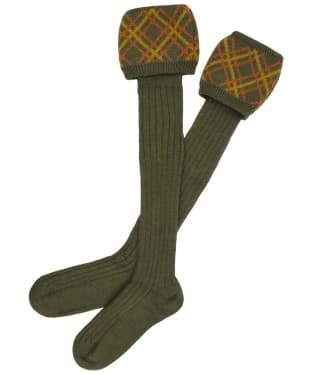 Sure to keep you warm on those cooler days, the Men's Pennine Chiltern Shooting Socks have been crafted from the highest quality wool, with nylon reinforcement to the heel and toe for a durable, supported feel. 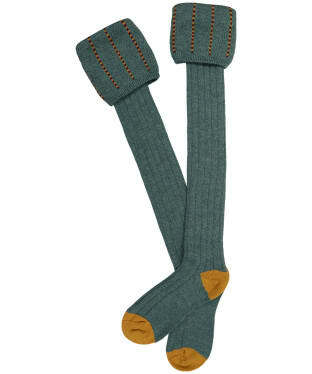 Sure to keep you comfortable whilst you are out on those country pursuits, the socks boast a colour contrasting cuff for that added touch of style. 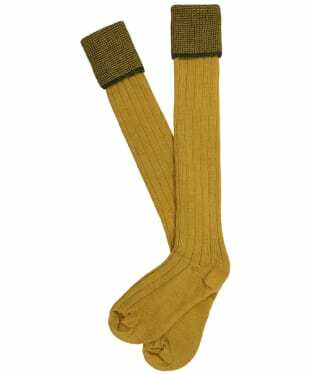 Crafted from a high quality merino wool and nylon mix for a soft, comfortable and durable feel, the Men's Pennine Bristol Shooting Socks are sure to be your perfect partner for wearing whilst out on those country pursuits. 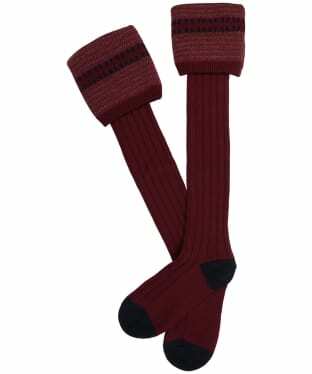 With contrasting colours to the heel and toe, these Bristol Shooting Socks are sure to add a stylish edge to your outdoor ensemble. 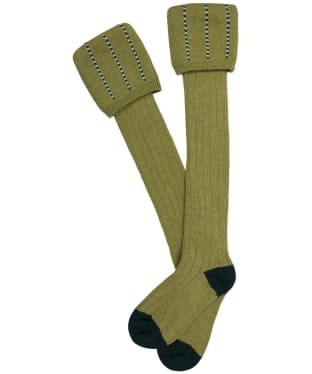 The Men's Pennine Norfolk Shooting Socks have been crafted from the finest wool and nylon for a warm and comfortable feel, whilst offering high levels of durability, making them your perfect partner for those outdoor pursuits. 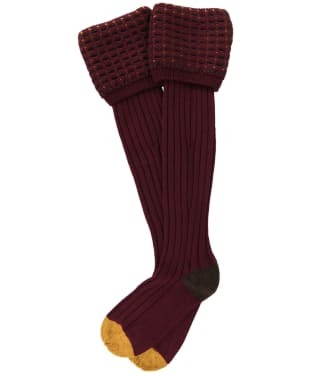 With nylon reinforced heel and toe, the Norfolk Shooting Socks are built to last, and feature a contrast colour making them the ideal piece to complete your stylish, country ensemble. 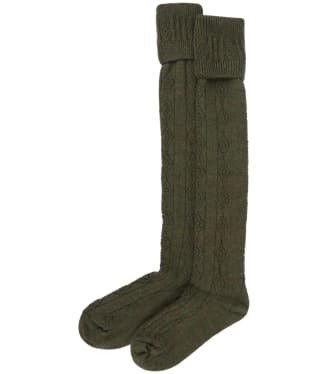 Sure to complete your stylish country ensemble with ease, the Men's Pennine Defender Shooting Socks have been crafted from the highest quality wool, keeping you warm on those cooler days. Designed to last season after season, the socks boast an added touch of nylon to the heel and toes for a durable feel, with the flat toe seem offering added comfort and wearability. 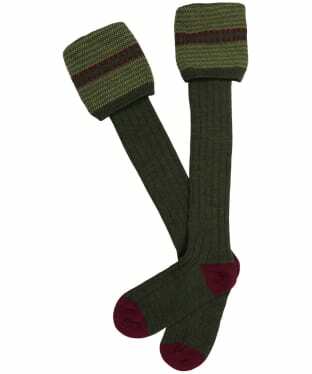 The Men's Pennine Penrith Shooting Socks have been crafted to offer warmth and comfort for those days spent in the great outdoors. 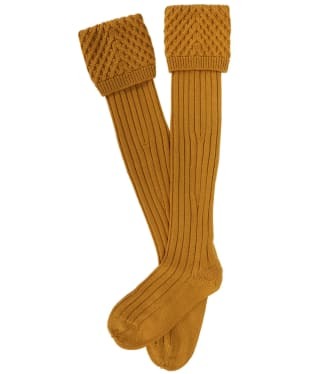 Constructed from a high quality wool and nylon mix, the Penrith socks will offer comfort, and support performance, with the reinforced heels and toes offering the upmost durability. 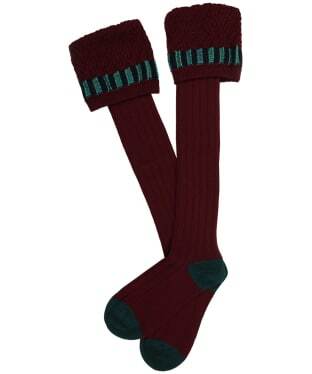 These shooting socks are finished with colour contrast detailing to the cuff for that added touch of style. Crafted from wool and nylon, you can be sure that the Pennine Beater Shooting Socks will keep you nice and warm, whilst being durable for those days out in the country. Boasting a nylon reinforced heel and toe and flat toe seem, they will be comfortable for you to wear. 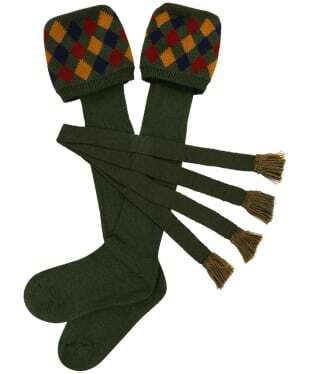 The Beater socks are perfect to complete any country outfit, making for a great treat for yourself or a loved one. 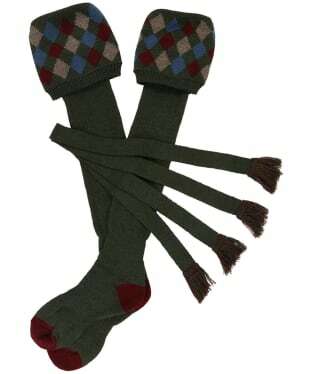 The Pennine Byron socks are a stylish and practical way of adding to your country outfit's this season. 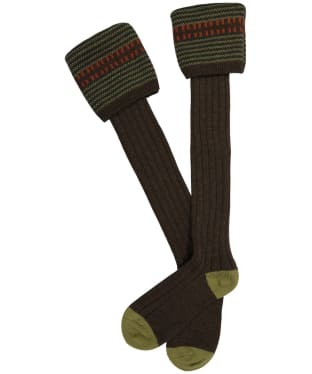 The Byron socks are simply designed, with contrasting stripe around the cuff that matches the heel and toe. 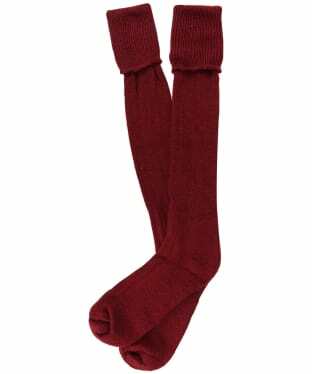 The sock are crafted with the highest level of detail, using high quality wool in a twofold yarn, and knitted to just the right tension, to give you a ultra comfortable and practical pair of shooting socks to complete your outfit. The Pennine Viceroy socks are perfect for both the country lady and gentlemen, adding the finishing touches to your country look. 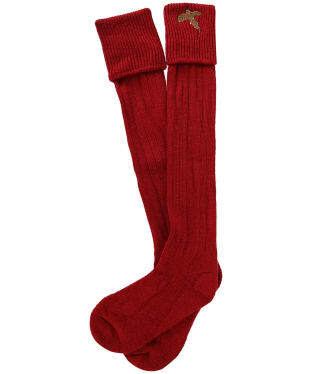 The Viceroy socks have been crafted from extra fine Merino Wool, for a comfortable, luxury finish you are bound to love. 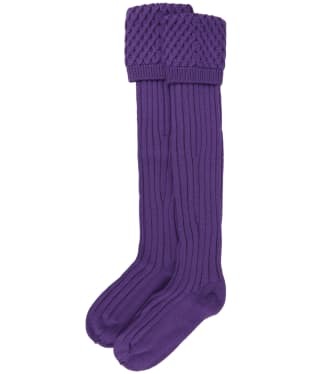 For an added touch of durability these socks feature a nylon reinforced heel and toe, as well as been shrink resistant for a perfect sock built to last! 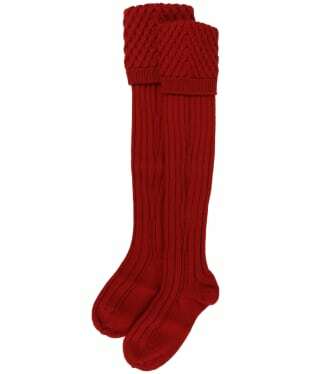 These socks feature a tailored leg ideal for a wider fitting calf, offering you added comfort this season and beyond. The Pennine Gamekeeper Socks are made from a wool and nylon mix so they are durable and warm. They also have a nylon reinforced heel and toe, flat toe seam and cushion foot for your comfort when out and about on your feet.